The Dent was mentioned in this article that appeared in the Cleveland Plain Dealer on April 5, 2000. I have found several news stories online about someone named Michael Patrick Moore who had a strange and unusual Tori connection. Michael Patrick Moore was an inmate serving two consecutive life sentences at Utah State Prison for some murders that took place in 1982. The inmate worked with computers at the prison and wrote programs for them, including those at Utah Correctional Industries (UCI), where he worked. The first time he is mentioned in connection with Tori is in the July 14, 1997 edition of the Salt Lake City Weekly. The article states, "A Utah prison inmate has been banned for life from computers after allegedly going on-line to send complimentary, if off-color, e-mail to female rock star Tori Amos." The article mentions Tori several times and you can read it on this archive page. In any case, Moore was somehow exonerated and he once again began using computers. His name appeared again in the April 30, 2000 edition of the Salt Lake Tribune shortly after he hung himself in his cell. This article mentions the 1997 Tori incident, as well as the mysterious circumstances of his death. That article is also available on this archive page.. I do not know any details about these emails to Tori (They could have simply been to her record company.) I also don't know if they ever decided who did sent her the emails. But it was odd to see Tori's name in conjunction with these news events. Rendered in a soothing mauve, Tori Amos's online home won't floor you with Shockwave pyrotechnics. Still, its interactive elements are quite amazing. Tori's fans can't complain that they're unable to express themselves here: The chat room and bulletin board are always bristling and extremely well organized; all new users are warmly greeted. Sarah Francesca D'Ambruoso and sweetcan were the first to alert me to a Tori article and interview that is from Launch.com and posted to the MSN web site. It refers to Tori's plans for 2000 and the movie score she is working on. This article seems to say that what she is working on may or may NOT see the light of day. Let's hope it does! Tori also talks about the new speed boat she plans to get in 2000. If that link does not work, you can read the article on the Dent as well. Many of you may have heard a few weeks ago the terrible news that two 19-year old college students, who were in Costa Rica as part of a co-op program, were murdered. They were Emily Howell of Lexington, Kentucky, and Emily Eagen of Ann Arbor, Michigan. I was just informed today that the April 3, 2000 issue of People Magazine includes a story about these two young women. 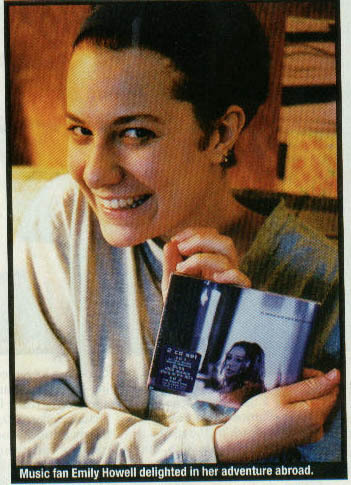 The picture on the first page of the article has victim Emily Howell excitedly smiling into the camera displaying her copy of "to venus and back". The caption reads, "Music fan Emily Howell delighted in her adventure abroad." Thanks to soraya and ratt for making me aware of this. You can see Emily's photo to the right and click on it to see it larger. I also got an email from Colette Alexander, who was a friend of Emily Eagen. The other Emily was also a Tori fan. The news of their deaths saddens me greatly and I wanted to pay a tribute to both Emilys on the Dent. My heart goes out to their families. There are no words that can soften the horror of this, but I hope that people will remember these girls in their thoughts. As Collette said, "These two women had amazingly full and beautiful lives, and celebrating them is, I think, the best way to honor their memories." You can read more about this at the CNN web site. UPDATE: They likely caught one of the people responsible for this. Check the CNN web site for details. The April 13, 2000 issue of Rolling Stone Magazine (w/DMX on the cover) includes a Tori quote in the Loose Talk section. What is interesting about this is that it appears in the magazine under an interview and photo of Joni Mitchell where they mention she just re-recorded "A Case of You" which of course, Tori covered. The quote from Tori is, "There are things I won't expose. Like who my musical influences are. I'm gonna tell you who I've slept with before I tell you that. Certain things are sacred." Thanks to sweetcan for telling me about this. This quote originated from Tori's appearance on E! News Daily in October 1999. Toriphiles Wendi and Stacy Delmonte inform me that Tori appears in the April 2000 issue of Spin Magazine. This is the 1985-2000 Special Anniversary Edition with four different covers - the Beastie Boys, Madonna, Nirvana, and the Notorious B.I.G. 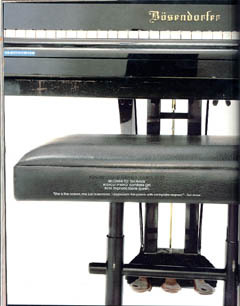 The issue includes various rock memoriablia. There is a photo of Tori on page 101 with a famous 1996 quote on Lucifer. 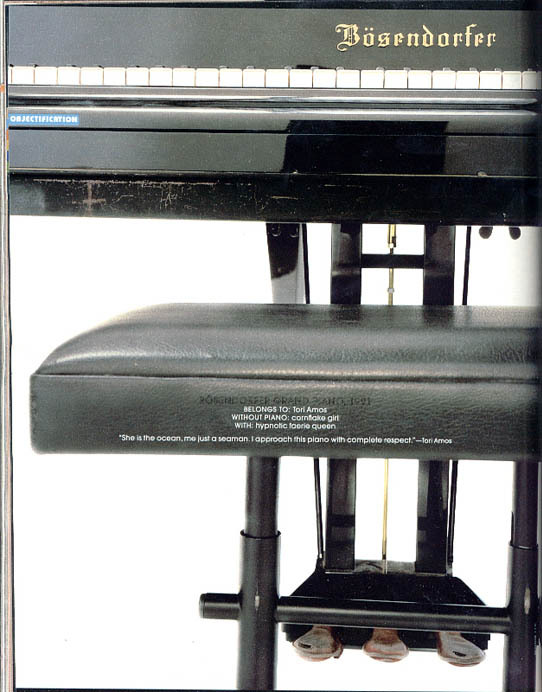 Her Bosey is featured on page 136 with another quote from Tori about the piano. See the photos and read the quotes below. Thanks to Stacy for the scans! Click to see this one larger. There are some other Tori mentions in this issue. Page 164 mentions that the number of Spin magazine covers that did not feature women not named Courtney, Tori or Madonna was only 57. 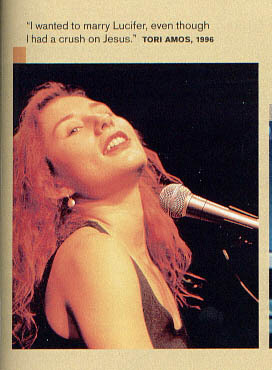 Page 165 mentions that in 1999 Tori Amos was voted Best Solo Artist by the reader poll. There's another Tori appearance that's a little harder to spot. Pages 24 and 25 are an Armani ad, and in between them is a "booklet" that on the front and back is also an Armani ad. However, open this up and it proves to be a poster the size of four Spin magazine pages, featuring a picture of every Spin cover up until March 2000. All three of Tori's covers are there.